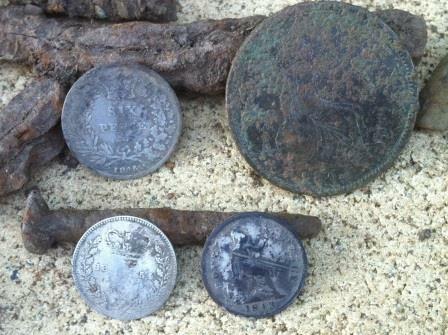 Hit an old general store site where I have found some awesome coins including a gold sovereign, but today it was to be a trio of queen Victoria silvers. It was a great day and you could certainly tell that spring was just around the corner with the sun shining all day. 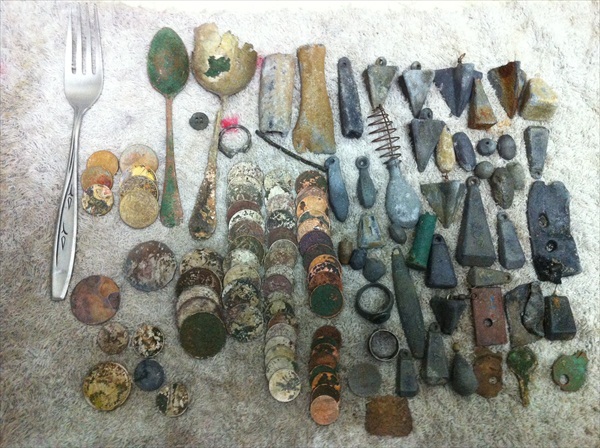 This site is literally riddled with trash and hard to detect, so it was slow going as I inched my way through the multitude of rusted iron that was sending my detector into spasms. A half an hour of this was really doing my head in, then I scored good solid signal 10:36 -12:36 right on the edge of a piece of iron, it was an 1844 Victoria 3d much to my delight. I kept at the slow torment for about another half an hour before deciding to bring out the CTX 17 monster coil to give the paddocks a good going over out wide from where the store actually stood. 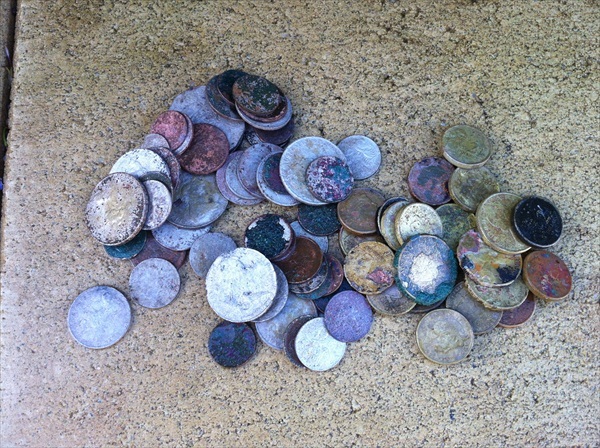 There are stacks of molten lead pieces all over the place that damn well sound just like a gold coin, but after digging about 30 or more of them I was starting to ignore them, leaving me with that nagging feeling of “maybe that one was a sovereign”. 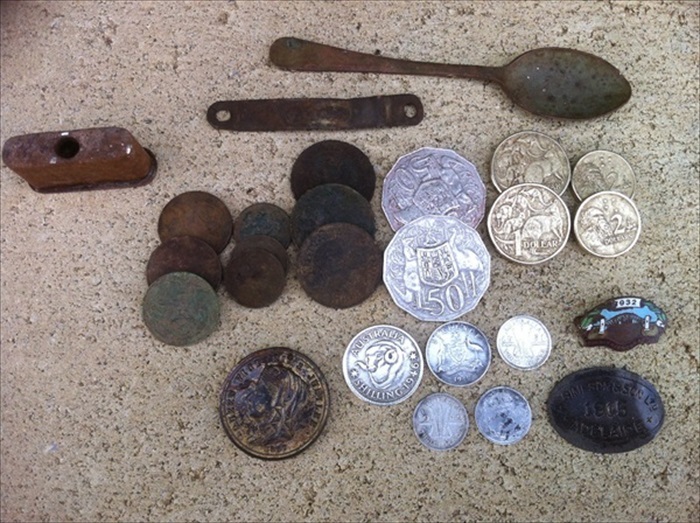 Oh well it was worth heading out a bit wider into the paddocks because I scored two more Victoria silvers, an 1843 groat and an 1846 sixpence. 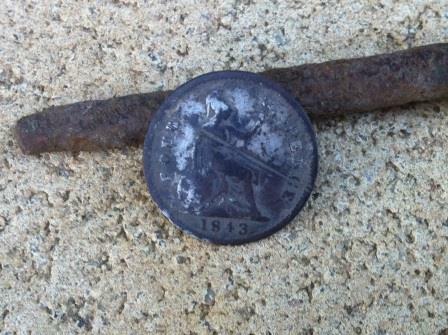 My last coin for the day was a lonely 1865 Victoria Penny that just looked out-of-place against the trio of silvers. Happy hunting and keep swinging that coil you just never know what’s coming next. 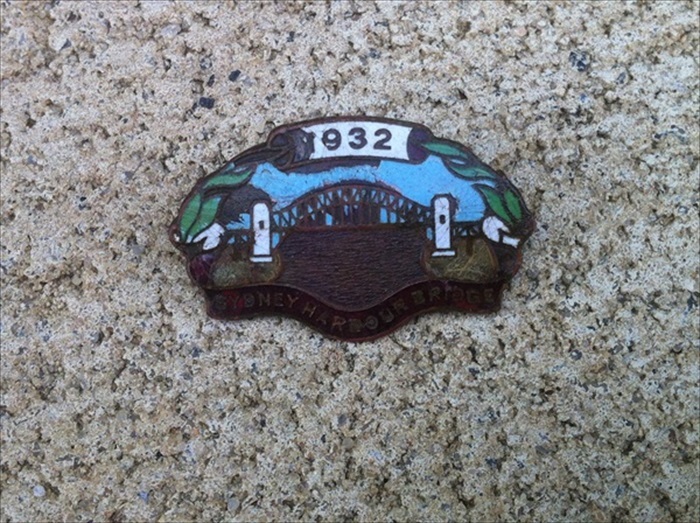 I wasn’t going to post anything about this badge until Dutchy (mate) rang me and mentioned some of the history, which inspired me to do this post. In 1815 Francis Greenway proposed building a bridge from the north shore to the south shore of the harbour. After World War I serious plans were started and the New South Wales Government invited worldwide tenders to construct the Bridge designed by, Dr J J C Bradfield the Chief Govt Engineer for NSW and officers from the NSW Department of Public Works. The contract was won by an English firm Dorman Long and Co of Middlesbrough in 1922 and construction started in 1924 and took 1,400 men eight years to build costing of £4.2 million. Six million hand driven rivets and 53,000 tonnes of steel were used and it now has eight traffic lanes and two rail lines. The opening celebrations included a cavalcade of floats, marching bands proceeding through the city streets and across the deck, where hundreds of thousands of people waited patiently for the official opening by the Premier but a character by the name of Colonel Francis Edward de Groot of the para-military group, the New Guard had other plans . 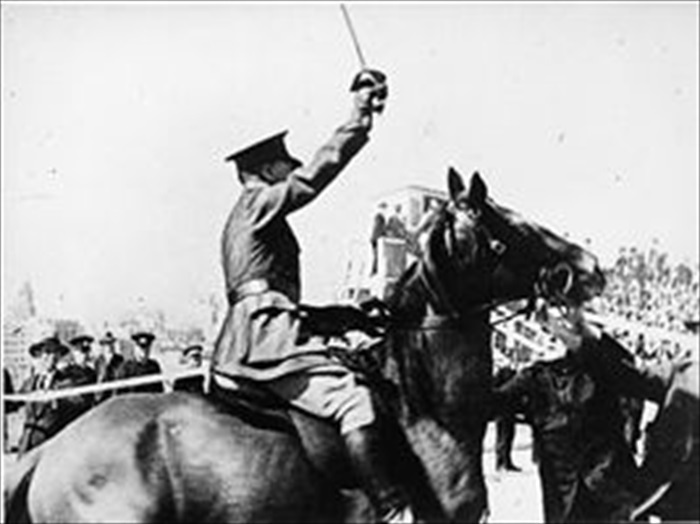 Colonel Francis Edward de Groot (24 October 1888 – 1 April 1969) and his faithful but borrowed steed Mick hold a notorious place in Australian history for the upstaging of New South Wales Premier Jack Lang at the official opening of the Sydney Harbour Bridge in 1932. Before a crowd of 300,000 people while dressed in his military uniform he was able to blend in with other soldiers who were guarding the dignitaries. Just when Lang was about to cut the ribbon to formally open the bridge, de Groot rode forward, drew his sword, reached down and flamboyantly slashed the ribbon. He went on to declare the bridge open “in the name of the decent and respectable people of New South Wales”. W.J. Mackay, Chief of the CIB, dragged de Groot from his horse, arrested him, and confiscated his ceremonial sword. He was taken to a small police station attached to the toll house on the Sydney Harbour Bridge before being sent to the Lunatic Reception House at Darlinghurst, he was formally charged with being insane and not under proper care and control. The magistrate released de Groot from the Reception House as he was found to not be insane, he was fined but later was able to turn it all around to make a nice profit from the ordeal. 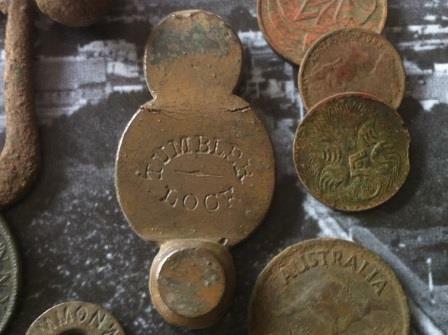 Thanks Dutchy, for yet again have I been able to look back into Australian history and discover something I didn’t know from a simple badge found while detecting. Such a great hobby so let’s make sure we do the right thing and look after it, happy hunting. The title says it all, how guilty can we be of presuming that an area has always looked the way it does. My experience has taught me that we often over look these tucked away spots because they now look overgrown, dusty or just simply out-of-the-way and unappealing. With detecting becoming more popular, you now need to really think outside of the square and get some serious research happening, fast disappearing are the days of just wandering onto any park and having a good hunt. Some of my best hunts have come from dusty corners of parks and recreation areas that were once the main bustling picnic spots of past generations. Yesterday was no exception when I went back to one of these gem areas I have detected before, my first target was iffy with the CTX 3030 jumping around between 10:41 & 12:45, this signal was typical of the many pocket spills I have been finding of late since running the CTX 17 smart coil. 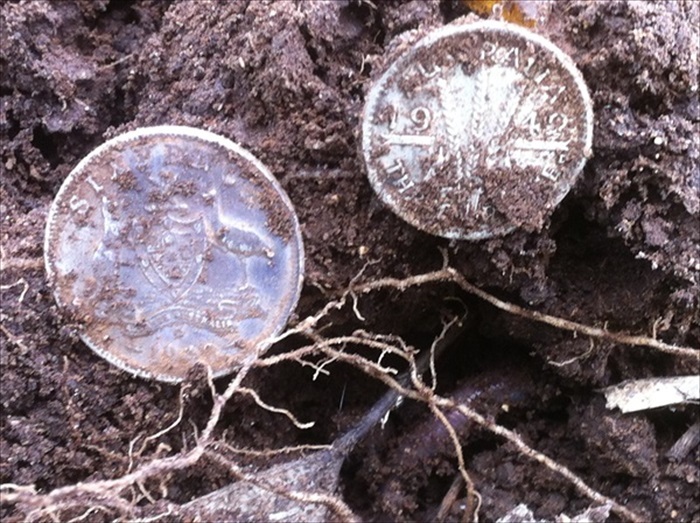 A nice start with dual silvers from my first hole a 1942 threepence and sixpence. There was plenty of moisture in the ground so I was moving slower than normal trying to sniff out any hidden treasures that I had missed. 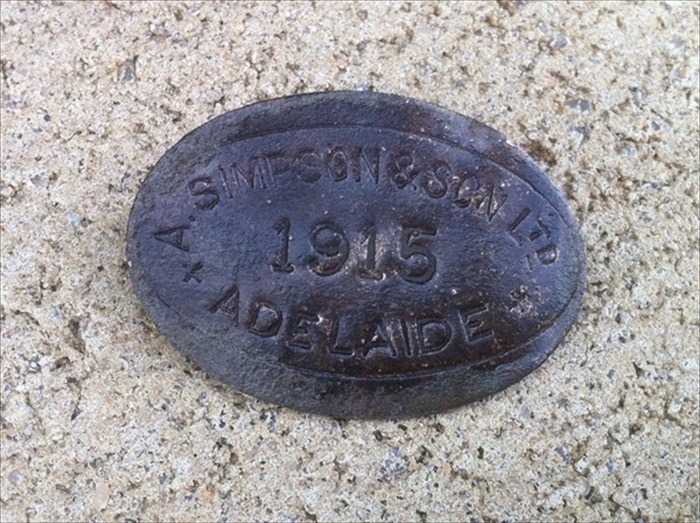 I got a good solid 12:27 and pulled one of my favourite targets a metal plate with writing on it, another history lesson coming up as I read the words A Simpson & Sons 1915 Adelaide. Turns out that A Simpson & Sons was, Alfred Simpson who arrived in South Australia in 1849 and although Simpson had his tinplate workers apprenticeship he was yet to have worked in the industry in England. After trying various occupations including some time in the Victorian goldfields he finally, in 1853 established himself as a tinsmith, the ‘Colonial Tinware Manufactory’ in Topham Street, Adelaide (Topham Mall as we know it today). Simpson’s son, Alfred Muller Simpson, joined the business in 1864 and his sons, Alfred Allen (known as Allen) and Frederick Neighbour also joined the firm when they had finished their schooling. The business incorporated 1910, with Alfred as chairman, and Allen and Frederick as directors later becoming the Simpson washing machine company. The Simpson Desert was named by Cecil Madigan, after Alfred Allen Simpson, an Australian industrialist, philanthropist, geographer, and president of the South Australian branch of the Royal Geographical Society of Australasia, also Cape Simpson in the Antarctica named after him by Douglas Mawson. As I said I love these old plates with writing on them and the history they reveal. 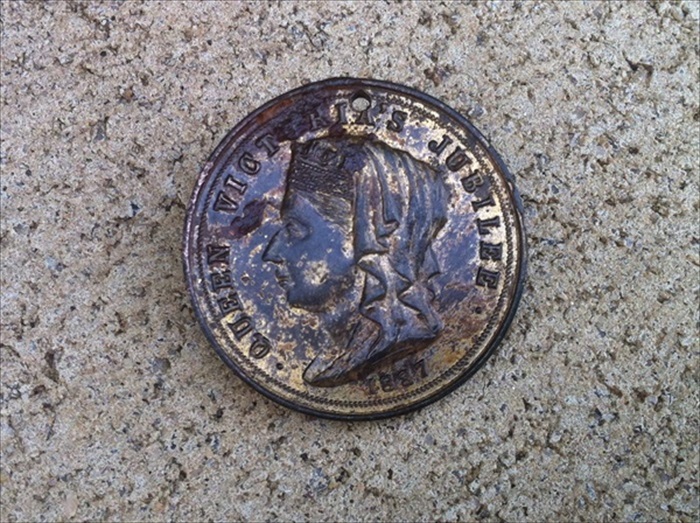 Next signal was from under an overhanging branch, a solid 12:41 and from around 6 inches I scored an 1887 Jubilee of Queen Victoria, South Australia Exhibition medallion, I found one last year also commemorating the exhibition but that one was silver, around the size of a threepence. 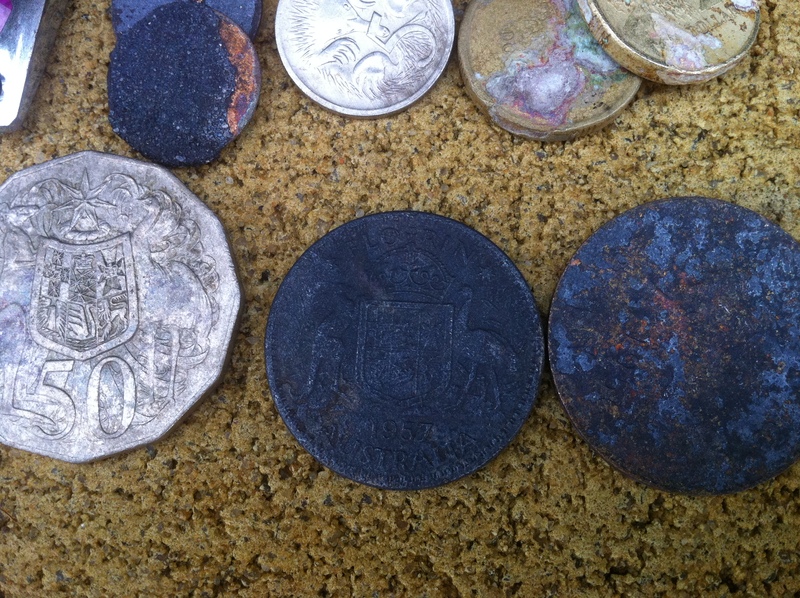 It was one of those dream hunts that just got better with each target, I found a few more small silvers before a another signal got my attention between jumping between 12:36 – 12:38, a nice little 1899 Victoria veil head 3d was a very welcome addition, just allowing me to scrape into the 1800’s. 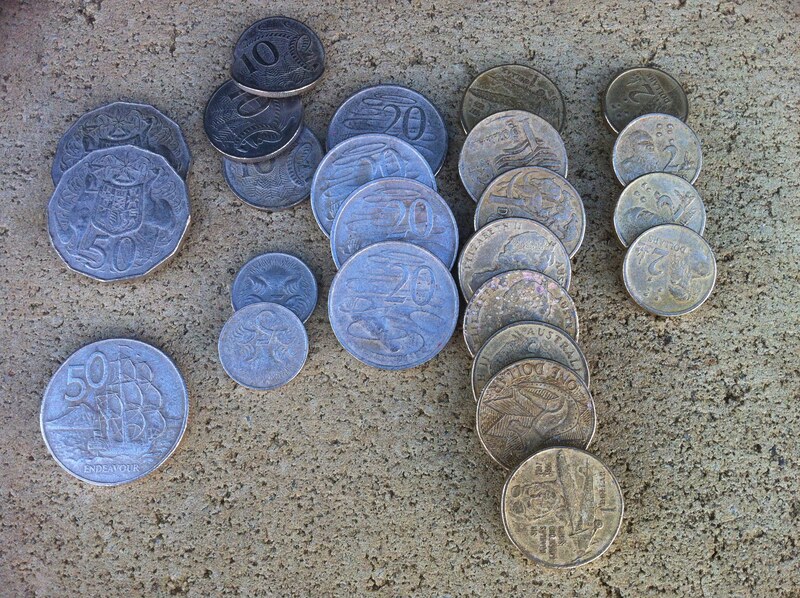 Silver tally for the day was five after scoring a lonely 1946 ram shilling on the way back to the car. So as the times get a bit tougher with more and more people flocking to this great hobby, remember to take more time out to research than hunt and start to think outside of the square, keep that coil low. The best things in life are worth doing one at a time, happy hunting. Had time for a quick swing with the CTX 3030 at the beach today in an area where it has been stripped back to the clay base. 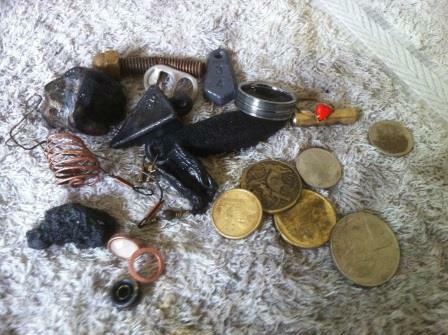 Scored all the usual sinkers, lures amongst a few modern coins with the exception of a very hammered penny and a 1957 florin, all very crusty indeed. Keep at it and happy hunting. 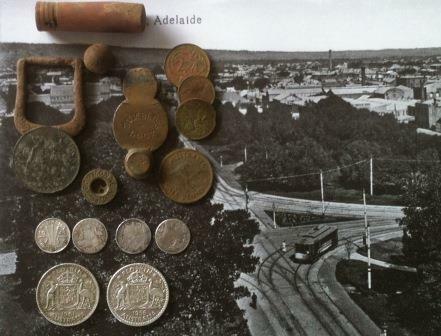 About a year ago I detected a spot in Adelaide that has continued to give up a mix of finds dating from the mid 1800’s right up to the present. With an hour to spare between jobs I fired up the CTX 3030 coupled with the CTX 17 coil which seems to be my weapon of choice these days. The area has a couple of massive pine trees that look to have been planted with even spaces either side of a big old peppercorn tree, this is the hot spot for the finds from the 1800,s. 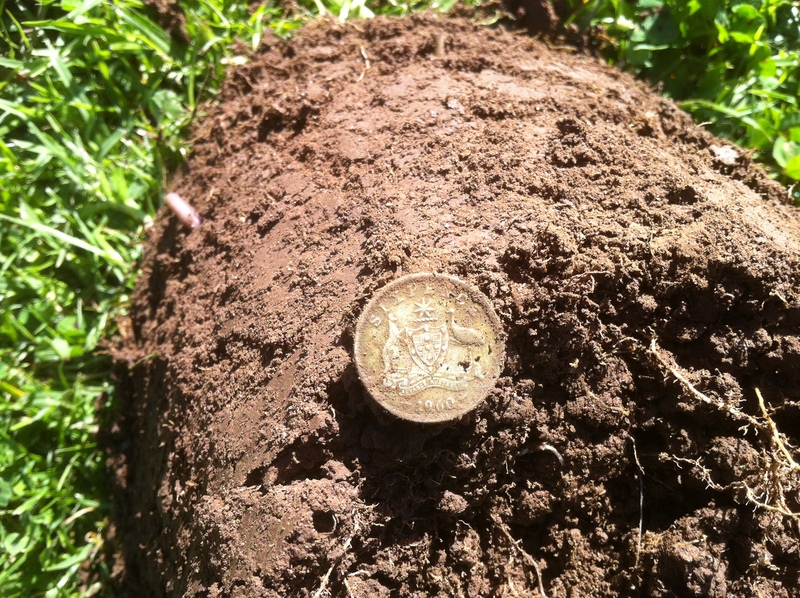 My plan was to make my way towards the peppercorn tree while detecting as I go, bang 12:41 solid and from only about 5 inches a nice 1961 florin, what a dream start. This area has always produced the highest ratio of silver to copper out of all the places I have hunted and today looked like it may be no different. 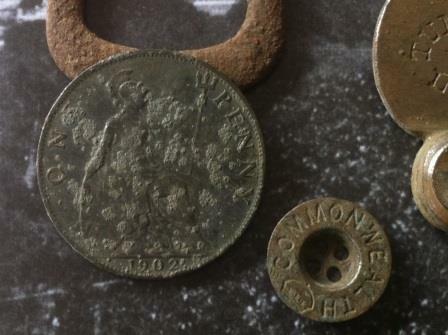 This was followed with a 12:38 that was a 1902 Britannia penny, a kangaroo half penny then a nice 1918 threepence. As I got nearer to the tree there was a scratchy repeatable signal that kept displaying a 37 as the second number on my tone ID, these are always worth a dig as they often are small silver coins as was the case here. 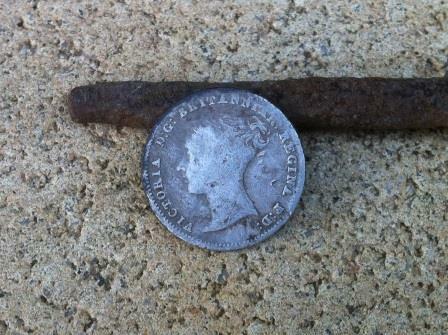 I had a bit of trouble locating it in the reactive soil but it was a well-worn but neat 1880 Victoria 3d a couple more relics surfaced from near the tree, one was a pants button with commonwealth and a crown on it, the first I have ever seen of this type. Near the next pine tree I got a 12:40 tone Id that turned out to be another well-worn Victoria 3d dated 1878 as the silvers kept flowing. 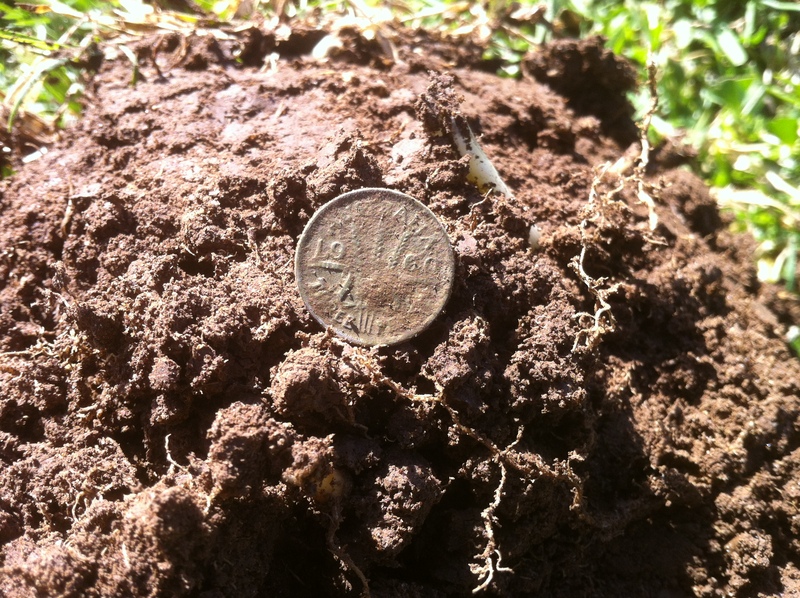 The next coin was a two-cent piece, then another threepence this time it was an Australian dated 1944, I love hunts like this. A steady flow of crappy targets was slowly seeing me running out of time and interest but as I made my way back to the car the CTX screamed out with another 12:41, and yes a 1956 Florin to finish on. Happy hunting all and keep that coil low. Wind, wind & more wind pretty well describes this last week in Adelaide. 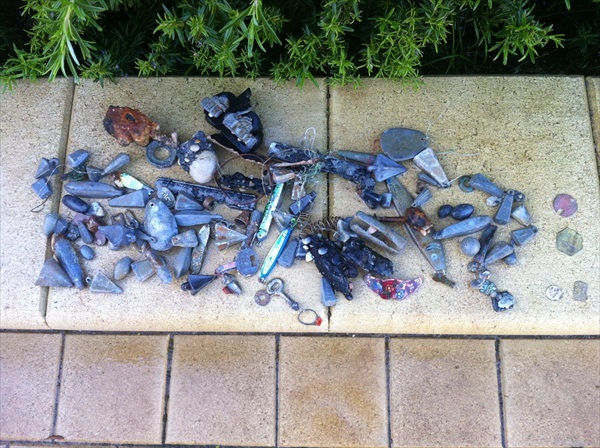 Although this can be annoying for most, it is far from that for us detectorists because we know well and good that the big angry waves are replenishing the beaches with goodies. With a bit of a break in the weather I quickly headed down to one of my favourite honey hole on the beach, for those who don’t know, a honey hole is a spot where the wave action consistently drops treasure in the same area. 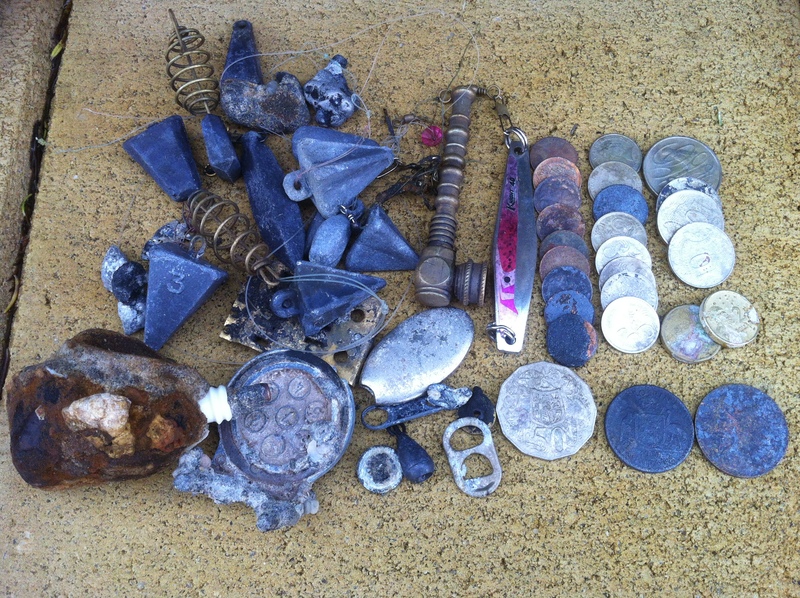 It was going to be a race against the weather, so I worked all the areas where the rocks had been exposed first and scored a few coins, junk jewellery, sinkers and the usual trash. I moved up to where the waves had thrown a lot of pebbles which were blackened from years of being buried under the sand, the same areas where rings can be trapped. I found a few more sinkers and coins before the CTX 3030 locked on to a solid 12:35 – 36 (often where chunky rings come in) and as I started to dig I kept thinking, let it be a gold ring. 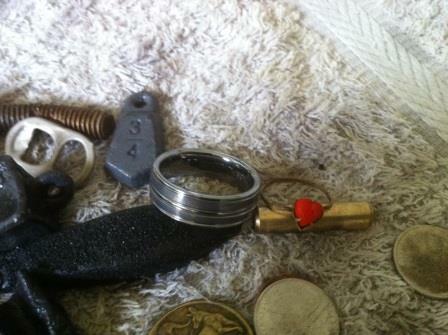 Then I saw a glimpse of the edge of a ring, I picked it up and thought WOW what a chunky heavy ring, it felt great. I wiped the sand off to reveal a massive silver looking ring, next thought was white gold but then I saw Tungsten TC 850, damn. Oh well still a great find. The weather had turned again so after scanning the immediate area around where the ring was I packed up and headed for home. What an awesome hobby that just keeps you going with the constant unknowing of what you are going to find next, happy hunting. 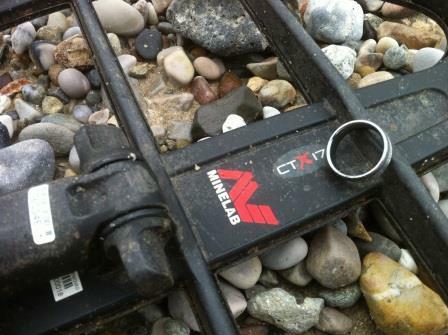 I took the Minelab X-TERRA 705 coupled to the 15″ Coiltek WOT Mk II 7.5 kHz medium frequency coil out for a hunt in an area where quite a few coils have been over, to see if it would produce any goodies. The first thing I noticed, it was quite stable and I could crank the sensitivity up a bit for extra depth. It wasn’t long before I was locked on to my first target, after digging down about 7″ I pulled out badge with BTPU on it. I wiped the dirt off to reveal Brick Tile & Pottery Union Australia, what a cool first find. 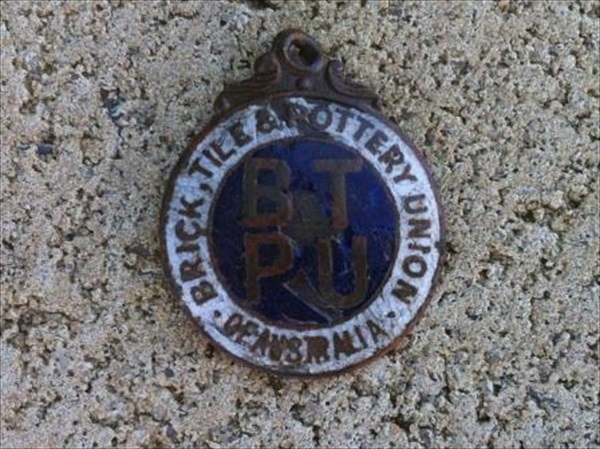 The BPTU is also known as the Federated Brick, Tile and Pottery Industrial Union of Australia and was formed in 1911 and operated until it amalgamated into the Construction Forestry Mining and Energy Union around 1995. Badges and pretty well anything with writing on them (not including coins) are amongst my favourite treasures to find because they always take me on a journey into the past, teaching me just a little bit more about our history. 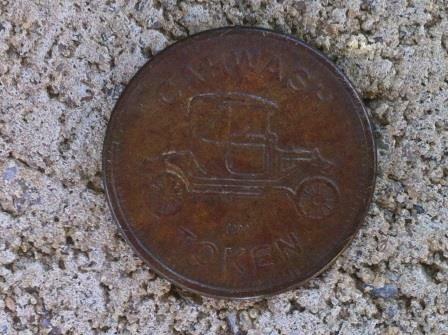 My next target was a bit broken and iffy but certainly repeatable enough to investigate, this time it was a vintage car wash token. 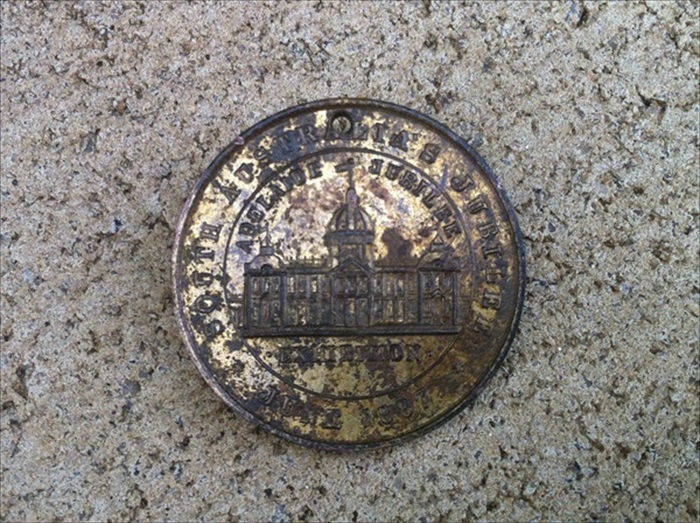 After cleaning it at home I found the letters HM underneath where carwash token was written, so I typed it into Google and up came, Hoffman Mint. Hoffman Mint design and manufacture Tokens, Medals, Coins and Key Tags and were established in 1980. There was a steady flow of screw caps, pull tabs with a few pennies and half pennies amongst them before the 15″ Coiltek WOT coil had locked onto another faint but solid signal that was repeatable from all sides. This target was between 8 – 9 inches deep, but as soon as it I gave it a light rub I knew it was something special, this coil was starting to impress me. Although the dirt was really caked on to it, I could make out the words WAR SERVICE and PATRIOTIC. I wrapped it in a small bit of paper so it didn’t get damaged and tucked it safely into my bag, I couldn’t wait to get home and clean it up and learn its story. I found a few more bits and pieces but this was the find of the day for me. 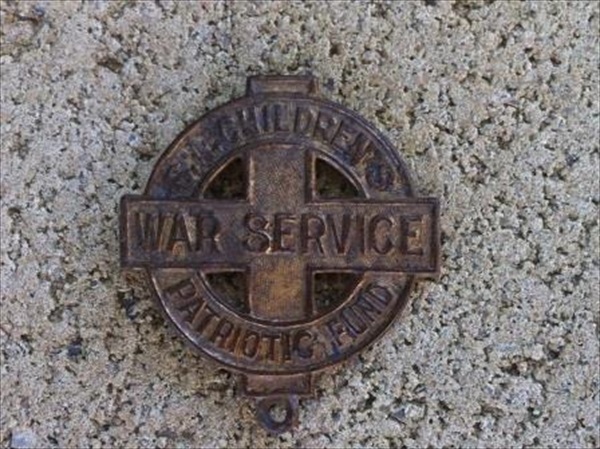 The South Australian Children’s Patriotic Fund was established in September 1915 and from the outbreak of the war began raising funds to aid Australian soldiers and various relief organisations. In 1915-17 Laetitia Miethke organized the South Australian Children’s Patriotic Fund, in 1940-46 she directed the Schools Patriotic Fund of South Australia and in 1941 she served on the Women’s War Service Council. In just over two years the children of South Australia, contributed over twelve thousand pounds was distributed to organisations including Cheer-up Huts, repatriation funds, hospitals, trench comforts, and the Red Cross. The trench comfort organisation was formed to try to make trench life a bit more comfortable, the children of South Australia knitted ‘trench comforts’ (socks and other woollen garments for soldiers serving in Europe). A link to the South Australian Children’s Patriotic Fund. A link with more about Laetitia Miethke and her achievements. The 15″ WOT coil worked a treat and had no trouble at all sniffing out a few deeper targets that had been missed, as I said before very impressive. 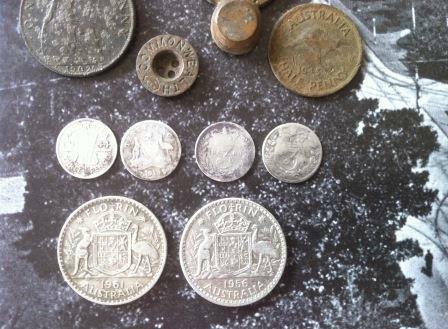 What another great hunt topped off with an awesome history lesson that took us to USA, South Australia and all the way over to the European Trenches of WWI. What a great hobby this is that really needs to be protected by all of us who participate. Make sure you clean up after yourself and don’t leave rubbish lying around, My Motto “DETECT IT – DIG IT – KEEP IT”. Happy hunting, keep the coil to the soil and think on this – To have time for what is valuable, you have to stop giving time to what isn’t. 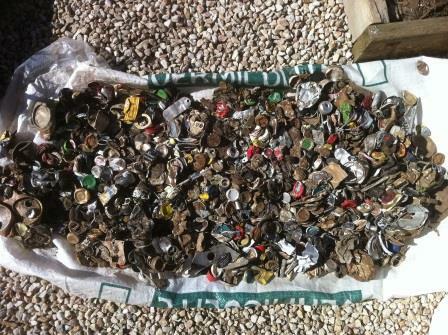 A rainbow of colourful bottle caps, screw caps, pull tabs and all sorts of discarded waste that is, dug from parks and ovals over the last month in search of gold rings. I am somewhat bothered that this lot of waste did not even produce one gold ring although there were plenty of coins etc, amongst it. I also put in a couple of huge days at the beach after a big storm had exposed the beach right back to black sand but again this was for no reward either, oh where, oh where are all the gold rings. 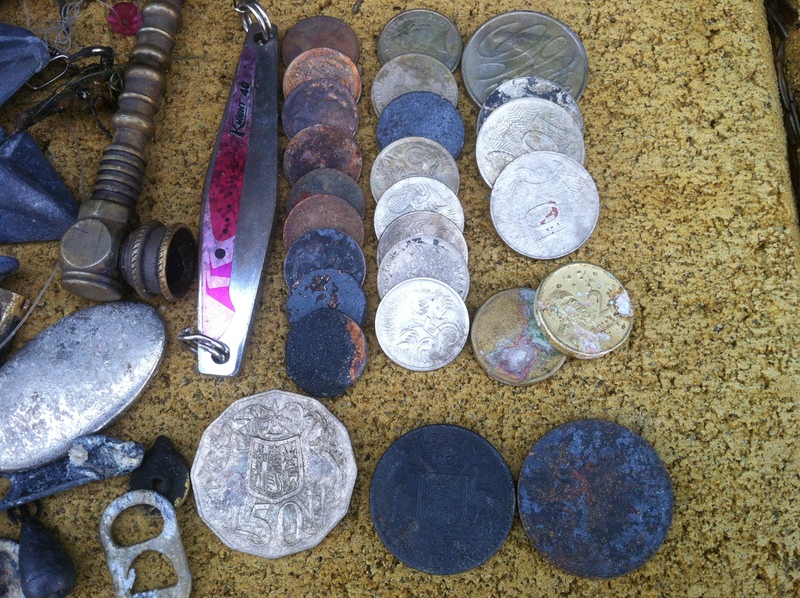 As you can see from the pics below there is literally tons of crap in the ground that we have to navigate around and as some say dig everything if you want to find gold rings, well this lot is proof that it isn’t that easy. I hope that this up and coming month will finally net me some elusive gold jewellery but if not then I will just have to be happy with the great clean up job that I do and contribution to recycling. Keep swinging and happy hunting to all, keep that coil low and remember success is not a race: it is a journey. 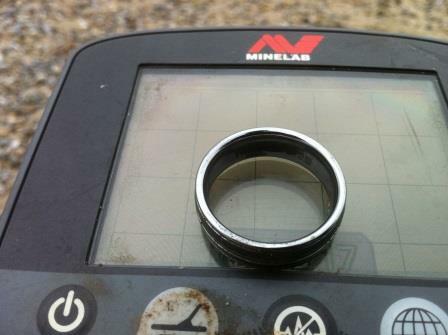 Send in the cleaner is what it feels like when I’m using the massive 17″ CTX 17 smart coil from Minelab as it finds target after target in ground that I have gone over pretty well. I had an hour to spare so I hit an oval that I have done well at in the past and scored a good handful of coins including a 1986 New Zealand 50 cent piece. They were really dirty and looked like they had been there awhile but certainly came up a treat after a bit of a clean. The CTX 17 coil coupled to the CTX 3030 continues to impress me with the amount of coverage you get while detecting and yet so lethal at sniffing out those iffy targets. Happy hunting all keep swinging you never know what is under your coil next. “Is there anywhere around here where you would like to detect for about half an hour” she who is to be obeyed asked me as we were driving home (obviously there was a near by shop). Hmm well the bottomless pit is just around the corner I replied, a quick detour and I was detecting within 5 minutes, it just doesn’t get any better than that or does it. As my time was limited I headed to the hottest spot I could think of on the oval and very slowly went over the area. I decided to dig everything that was repeatable regardless of how iffy the signal was and it certainly paid off. The first couple of targets were brown buggers (1 & 2 cent pieces) followed up with a nice 1960 threepence and a 1960 sixpence. At this point I was stoked because I knew that time was limited and I had already scored a couple of nice silvers. 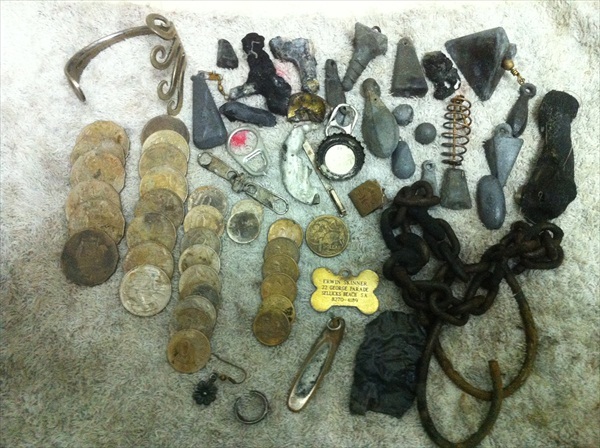 Just for a recap of the bottomless pit it has produced 3160 coins to date from this spot with plenty of silver pre decimals amongst them and with todays finds the tally now is 3173. I am no longer surprised by the pit and this was another great hunt. 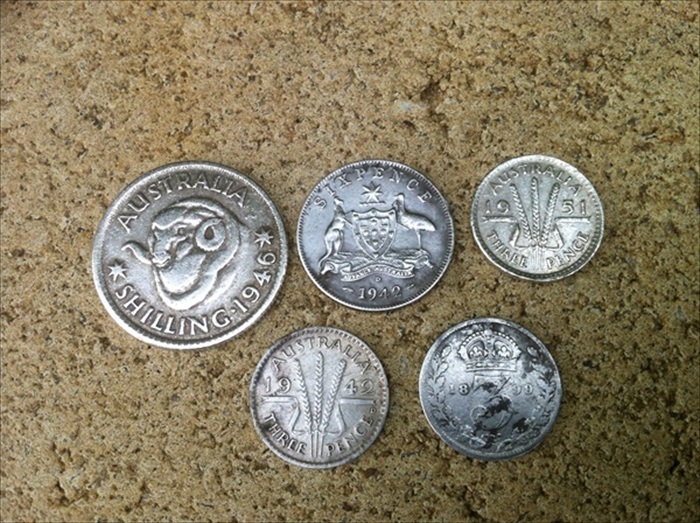 As the next couple of coins surfaced there were a couple more brown buggers, a fifty cent piece and then three more sixpences in a row with first two being post 1946 but the best coin for the day was the last one, a 1943 sixpence in pretty good condition. What a great little hunt with such limited time, then right on cue my lovely wife arrived back and it was time to head for home. Happy hunting all and keep the coil to the soil.